In last week's Finance Fridays we were looking at reasons why you may be struggling to sell your house. Thanks for all the extra tips that you provided. For this week we're looking at one of the biggest commercial rip-offs of the year – Valentine's Day! Once Christmas is out of the way the shops look towards one of their biggest money spinners of the year. 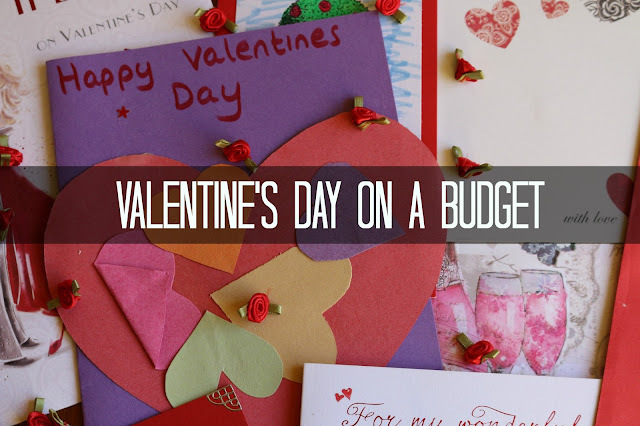 I realise many people shun Valentine's Day altogether but there are many ways to enjoy the fun of the day without getting caught up in the madness. My love is like a red, red, rose – If I did a word association game with Valentine's then red roses must surely come up at some stage. My favourite are the big, deep red Grand Prix roses which of course are some of the most expensive. I told Mr JibberJabber many years ago not to waste money on 'Valentine's flowers' Naturally, due to the high demand the price will be much higher than normal. Also Valentine's Day is in the middle of February so these roses are completely out of season and will have been airfreighted in and kept in cold storage until needed. If you're wanting to buy flowers go for something British and in season such daffodils. At the moment they are selling for around £1 a bunch. Keep away from the underwear – If your beloved doesn't normally wear red, lacy lingerie or tight fitting Calvin Klein boxers then Valentine's is not the time to introduce such items. If however they genuinely do like socks with animal faces or Star Wars characters on then go ahead and buy a pair. They will appreciate and actually wear them plus they'll only cost a couple of pounds. No teddy bears holding hearts – Also forget the balloons, heart plaques and anything else you see on sale at the card shop. I can't deny that there aren't a few cuddly toys (mainly cats) lying around JibberJabber Towers but special themed Valentine's gifts will look naff and out of place in a couple of weeks. If you're going to buy a gift make sure it's a lasting one. Make a meal of it – Most restaurants will be trying to flog their overpriced Valentine's menu. Instead of the quiet, intimate meal you dreamed of it will be packed and the service rushed. If you want to go out for a meal then go the night after when the restaurant will have returned to normality. Alternatively make the effort with a meal at home. For the second year running Miss JibberJabber is hosting our Valentine's meal! Remember when it comes to Valentine's Day it's the thought that counts not the amount of money spent! If you want to join in with this week's Finance Fridays then add your link to the linky below. Any post concerning financial matters is allowed. Full details here. It doesn't have to be published today as you have until 23.55 on Tuesday 9th February 2016 to join in. Grab my badge below for your blog post. It's definitely the thought that counts on Valentine's Day. I personally love to receive flowers but a nice bunch of blooms, not roses, are preferred as I know the price just shoots up (no pun intended!). Thanks for all your suggestions. My husband finds Valentine's Day especially tricky as this falls the day after my birthday. This year we'll be eating in at home as we usually find that overpriced menus don't usually result in better food or service! We do Valentines on a budget by not bothering ;)! I have to say I am a Valentines Day humbug, I prefer my romance spontaneous - however there are some lovely ideas here! We don't do Valentine's day at all, but I love your ideas.